Christmas is our busiest time of year and we have limited availability so the earlier you reserve a baby the more likely we are going to be able to meet your requests. We do NOT recommend hedgehogs as surprise gifts (see below) so decide if you want to make your appointment BEFORE Christmas or AFTER Christmas. Use our Make A Deposit link on our website to place a $25 deposit. The last button says “Other” and you will be able to fill in your information. Feel free to send a follow up email if you feel we need more clarification. We will also verify your information with you. Please refer to our Deposit Agreement and Deposit Refunds information, before placing your deposit. Ideally babies are six to eight weeks old before they go to new homes. We wait to make assignments until we know the babies are going to be ready to go at the desired appointment time. For example, someone coming after Christmas is likely to be assigned a younger baby than someone who has an appointment before Christmas. Babies grow at their own rate so there may be some variation. We will do our very best to make matches and the more simple the request the easier we can make a match. For example, a request for a normal colored male (or female) is fairly easy but a request for a female apricot may be harder because it is a more rare color and a specific gender. We will notify customers when they receive a match and babies will be listed online. If there is another hedgehog listed as “Available” customers are more than welcome to make ONE change before you come. The more changes we have the more likely we are to make a mistake and we want to avoid mistakes if at all possible. We understand that an online match is not always the best match for our customers. We will have two additional “back-ups” available but we won’t be able to identify which animals will be the back ups until your appointment. For example, if you have a deposit down for a boy, we will have two additional boys available. The person before you may have exchanged their hedgehog for a back up which would then give you a different set of back-ups than the previous person. Our Pets for Youth and Children Article outlines many of the things to consider when purchasing a hedgehog as a gift for a child. Sometimes children have expectations of what a hedgehog is going to be like as a pet. So when they meet a hedgehog for the first time they may be disappointed. Hedgehogs can be very prickly and some children are not prepared for a possibly pokey hedgehog while going through the bonding process. When hedgehogs are given as gifts the opportunity for a child to change his/her mind about having a hedgehog as a pet is lost. It is very important to read our article Pets for Youth and Children. We want all children and families to be prepared to be a forever family for a new pet. Some hedgehog breeders have a small herd and babies are reserved and sold based on availability. Other breeders are able to offer an opportunity to select a pet from a small group of hedgehogs. The opportunity to select a hedgehog based on its personality is a wonderful experience, and we encourage you to take advantage of this option if it is available. The time you spend with your breeder is one of the most important parts in purchasing a hedgehog. An experienced and knowledgeable breeder will give new owners lots of handling and care advice. A good breeder’s handling demonstration and the new owner’s practice with the hedgehog are keys to the new owner’s success. Learning to handle a hedgehog is comparable to learning to ride a bike or any other type of lesson. Personal instruction and practice is much better than watching a video or reading a book and will have significantly greater results. 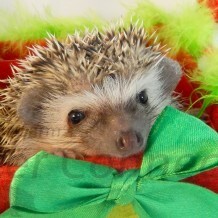 Gift certificate – many breeders will create a gift certificate to buy hedgehogs. Cage – a wrapped cage and/or accessories can be a great surprise for the new hedgehog owner. Stuffed animal – cute stuffed animal hedgehogs are excellent options for temporary substitutions of the real thing! Mystery Ride – some new hedgehog owners may enjoy the thrill of a mystery ride to pick up their new pet.